This giveaway is now over. Congratulations to Adam from Australia — he won a VaporFi Rocket 3 bundle for just $1.00. Sign up for my mailing list so you won’t miss the next giveaway. All of my subscribers are automatically eligible for all giveaways! Win a VaporFi Rocket 3 Bundle for $1.00! Have you heard? VaporFi is currently holding its biggest sale ever. For a limited time, all devices, starter kits and accessories such as tanks and atomizers are 25% off in honor of the new year! Click here to open the sale page in a new tab. You’ll see the discount in your shopping cart when you check out. Coinciding with the sale, VaporFi is sponsoring a giveaway through Vapegrl.com! 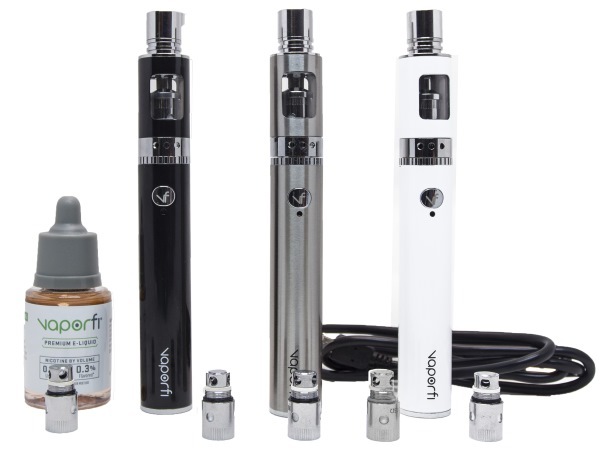 At the end of the month, I will randomly select one newsletter subscriber to win a VaporFi Rocket 3 bundle — a $123.99 value — for $1.00. The Rocket 3 is a tiny sub-ohm vape pen that delivers up to 50 watts of power and has three settings for wattage or temperature. It’s one of my absolute favorite e-cigarettes. Register below for a chance to win it! I will select the winner using Random.org on February 1, 2017. The winner will have one week to confirm, after which time I will select another winner if I receive no response. The winner must be a confirmed subscriber of my newsletter. This contest is valid worldwide wherever e-cigarettes are legal. You must be of legal smoking age in your jurisdiction to win. Void where prohibited. The winner will need to create an account on VaporFi.com to verify his or her age. The winner will pay $1.00 to receive his or her VaporFi Rocket 3 bundle to comply with FDA regulations regarding free products. Keep your mailing list subscription active! As long as you’re a subscriber, you have a chance to win any Vapegrl.com giveaway.